Set in lush tropical gardens and close to one of La Digue's fine sandy beaches, Anse Severe, Le Domaine de L'Orangeraie is a cosy, private hideaway. 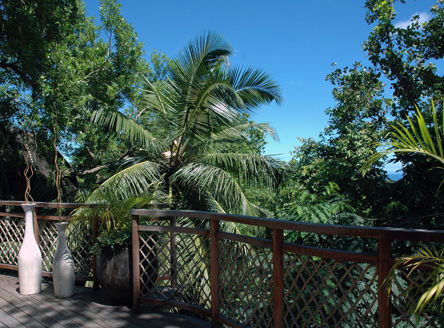 Local architecture is combined with the natural tropical hillside setting to make this a perfect Seychelles retreat for couples and families alike, as well as an amazing spot for a Seychelles honeymoon. 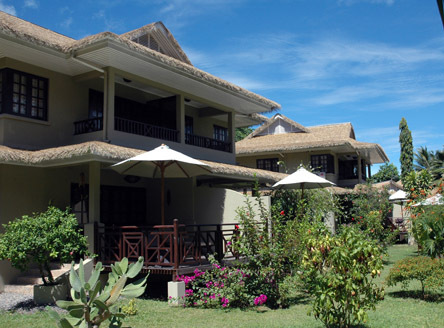 This boutique hotel offers just 53 individual villas nestled throughout the gardens and yet just a few steps away from the beach. 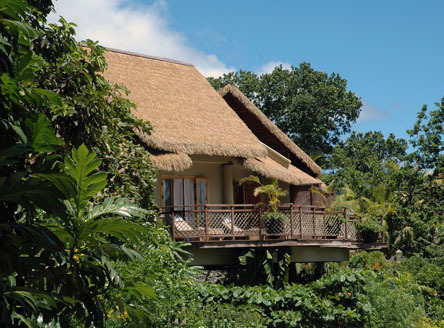 There are five different types (and size) of thatched villa, all providing spacious accommodation and large terrace or balcony - perfect for outside dining. Many also have outside bathrooms. Eight new Garden Suite Residences opened in April 2015 - sleeping up to 4 guests, these suites are located in a garden setting and feature a large bedroom as well as a separate lounge area which can also be converted to a separate sleeping area. Some of these new villas inter-connect. There’s also the Villa de Charme and Villa de Charme Elegance villa categories nestled in the hillside, offering a romantic setting for two adults. The Garden Villas are spacious and sophisticated, with cool furnishings and all interconnecting from the outside, whilst the Presidential Villa is a very grand affair, featuring its own private plunge pool and breath-taking views. Le Domaine de L'Orangeraie's all day dining area offers a relaxing environment from which to enjoy glorious views towards Praslin and stunning sunsets. 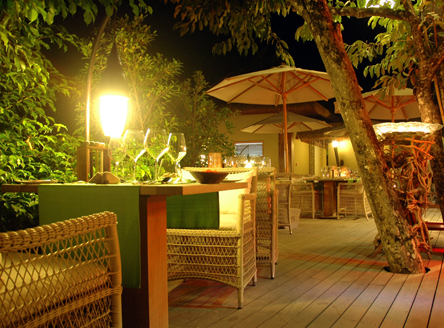 Here, a wide choice of Mediterranean menus together with Asian and Creole cusine and home-made specialities are served. Combava Restaurant, meaning kaffir lime, is located on the upper deck and is an exquisitely designed roof terrace lounge serving a la carte food only. Santosha Restaurant offers a cosy atmosphere for alfresco dining and serves popular international cuisine and local Creole delicacies with a mix of live cooking and buffet-style service. Breakfast is also served here. 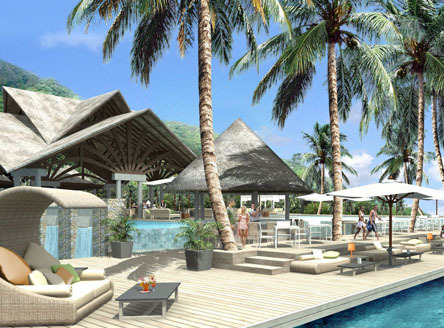 The swimming pool and terrace occupies an idyllic setting beside the sparkling ocean and with glorious views towards Praslin. This is the perfect place to relax and soak up the atmosphere. 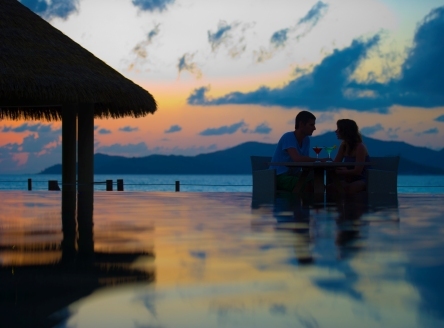 It is also the most romantic location to sip cocktails from the adjacent infinity pool bar, Le Cipaye. There is also a lounge bar L'Alambic. Adjacent to the pool deck is a lovely new beach area where guests can soak up the sun as well as benefit from the hotel's beach service including snacks and drinks delivery on request. There's also complimentary sunloungers, beach umbrellas and towels. The Eden Rock Wellness Centre & Spa, set high up at the back of the resort and surrounded by giant granite boulders, offers fabulous ocean views. As well as an extensive range of spa treatments it provides a Hammam, hair dressing facilities and manicure services. Special 3-night and 5-night Spa packages are available; please call for more details. 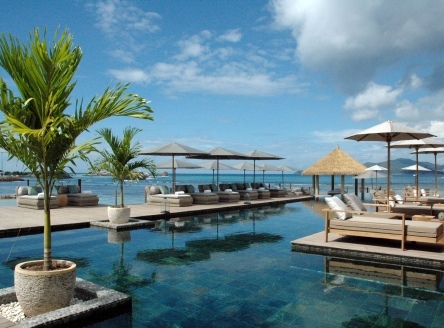 All guests at Le Domaine de L'Orangeraie have complimentary use of snorkelling equipment. Bicycles can be hired for approx. Euro5 per day to discover at your own leisurely pace the magical and beautiful surroundings of La Digue Island Seychelles. Inter-island flight from Mahé to Praslin and then road & boat transfers - approx. 1 hour 10 minutes, OR; inter-island boat from Mahé to Praslin and then road & boat transfers - approx. 1 hour 40 minutes. 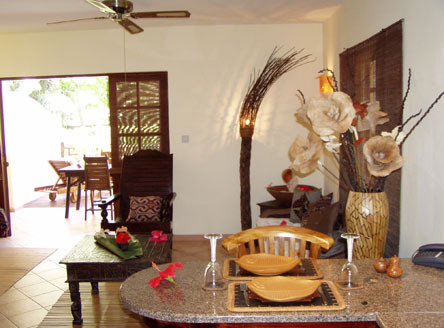 53 villas with air-conditioned bedrooms, ceiling fan, satellite TV, internet facilities (fee applies), safe, minibar, tea/coffee facilities and balcony or terrace. 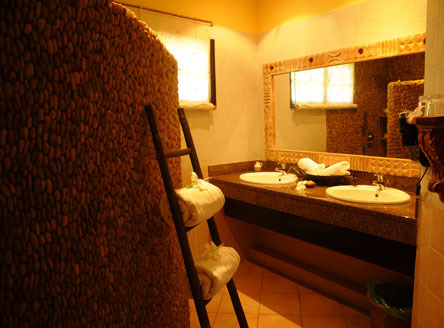 Many villas also have outside bathrooms. 20 Garden Villas (60m²): sleeping up to 4 guests. Connecting villas on request. 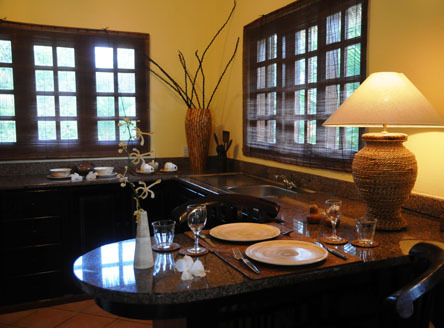 31 Villas de Charme (70m²): sleeping up to 3 guests and have outside bathrooms. Connecting villas on request. 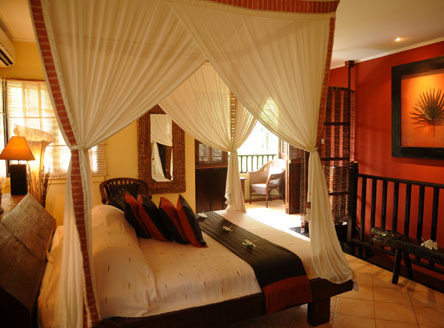 3 Villas de Charme 'Elegance' (100m²): sleeping up to 3 guests and incorporating an outside bathroom. 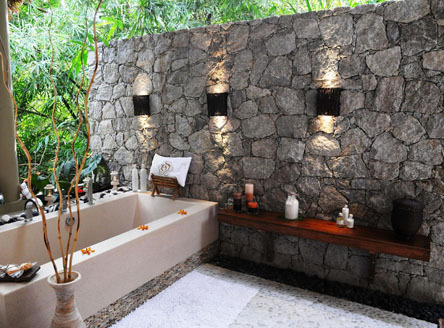 Offer more seclusion and include a whirlpool bath. 1 Villa Presidentielle (250m²): A private sanctuary with your own butler, private swimming pool, Jacuzzi and outside bathroom. Accommodates up to 6 guests. 8 Garden Suite Residences (100m²): Each offers a large bedroom as well as a separate lounge area which can be converted to a second area to accommodate an extra 2 guests in a queen bed. Total capacity: 4 guests. Bedroom and living areas have their own satellite TV. All feature luxury bathroom with outdoor shower concept, dressing room, mini bar, tea/coffee facilities, room safe, plus a large terrace. Please call for more details. 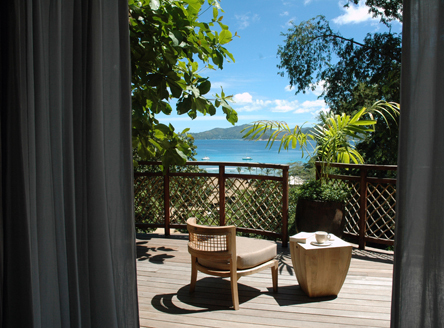 From £1979 per person for 7 nights Bed & Breakfast in a Garden Villa, including return flights from London, return inter-island flights from Mahé to Praslin, return boat transfers from Praslin to La Digue and all road transfers. Looking to book this hotel from outside of the UK? 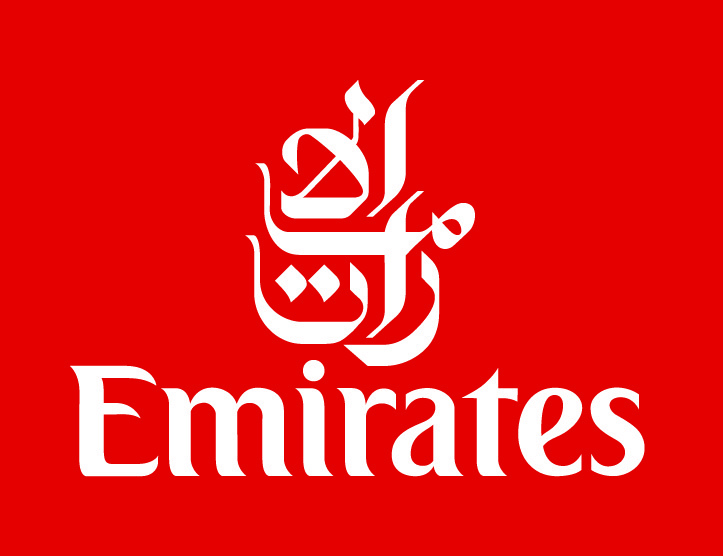 We can arrange accommodation with transfers as above from €1489 or US$1599 per person (excluding flights). Please call for latest validity dates. Please call for latest validity dates. Minimum stay: 5 nights.. Careful expansion has ensured the hotel had retained perfect harmony with its surroundings. Superb facilities. Very popular, so book early. “This has to be the most amazing trip ever! 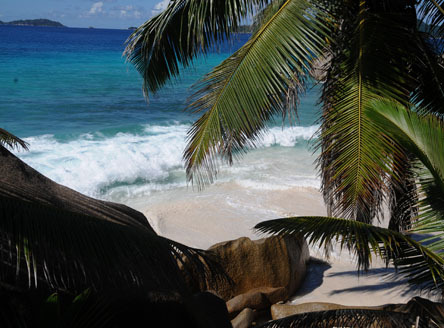 The Seychelles are simply beautiful and so relatively unspoilt by tourism. The whole trip ran like clockwork, but the most amazing thing was our surprise upgrade to the Presidential Villa at Le Domaine de L'Orangeraie - complete with its large infinity swimming pool. Thank you." 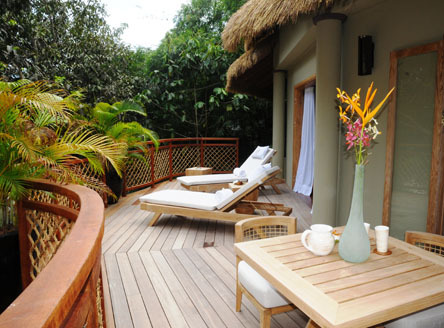 “If we visit the Seychelles again we would definately stay at the Orangeraie. It was a real pleasure to be there with all the smiling faces of the staff." Why not combine Le Domaine de L'Orangeraie with a fabulous Catamaran Cruise? A stay at the fabulous Le Domaine de L'Orangeraie makes a great combination with one of our superb Seychelles Catamaran Cruises. We can tailor any 'Cruise & Stay' package, from luxury resorts to boutique hotels.